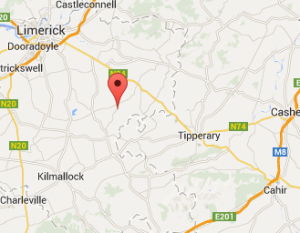 Our showroom is located at Kildromin, Kilteely, Co. Limerick. From Limerick: take the Tipperary road until you reach the village of Pallasgreen, turn right in the village just after the petrol station, it is straight on from here, do not turn off this road, continue for 3 miles going straight through the village of Old Pallas, keep right at the fork in the road after the village of Old Pallas, continue on the main road for another 3 miles, go straight through 2 cross roads, we are about 50yrds past the second cross roads on the left. From Dublin: Take the N7 (junction 9) off the M50. Follow the N/M7 as far as Port Laoise where you take the N/M8 take exit for Cashel, from Cashel head for Tipperary town, take the Limerick road out of Tipperary town, drive for approx 8 miles until you come to the village of Pallasgreen, turn left in the village of Pallasgreen heading for Old Pallas, keep right at the fork in the road after the village of Old Pallas, continue on the main road for another 3 miles, go straight through 2 cross roads, we are about 50yrds past the second cross roads on the left. From Cork: go through Fermoy, Mitchelstown, Ballylanders, Hospital, go straight through Hospital, continue for approx 2 miles, turn right at signpost marked Pallasgreen. Continue straight through the next 2 cross roads for almost 2miles, we are .3 of a mile past the 2nd cross roads on the right hand side. From Kerry: go through Newcastlewest, Bruree, Kilmallock, Bruff, go straight through Bruff, continue for almost 2 miles, turn right at the singpost for Knockainey. Continue for approx 300yrds, turn left at signpost for Herbertstown. Continue for approx 2.5miles until you have to stop at a large junction. Go straight through this cross roads taking the road for Pallasgreen. Continue straight through the next 2 cross roads for almost 2miles, we are .3 of a mile past the 2nd cross roads on the right hand side.